Making CoSHH Cabinets | How our CoSHH Cabinets are made. Making CoSHH Cabinets, how its done. Our CoSHH start out as flat sheets of cold reduced mild steel 1.22mm thick. The steel sheet blanks are guillotined to size and any material notched to accommodate corresponding parts when the cabinet bodies are assembled. These blanks are what forms the body of a CoSHH cabinet. All variations of CoSHH cabinets are manufactured in the same way. The door profiles which also incorporate the key hole and handle hole are produced from laser cut blanks. 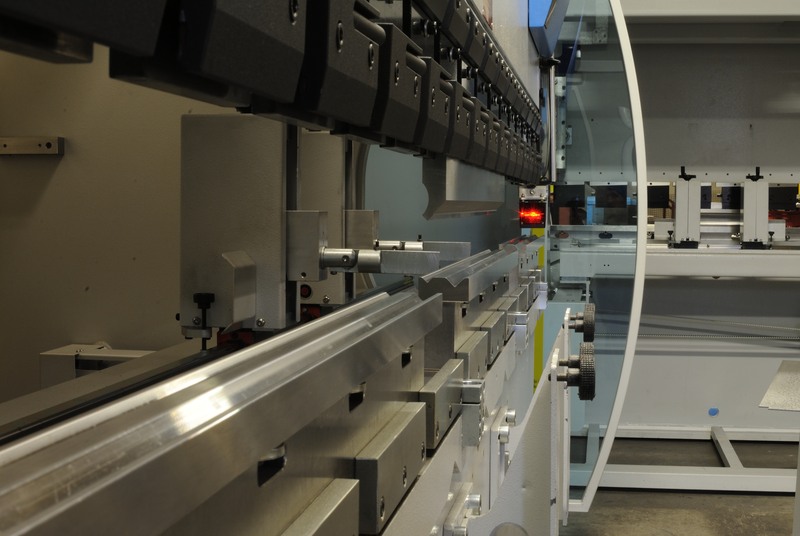 Using a Laser cutter to shape the steel blanks removes any necessary corners for clearance when bending and allows the cabinets to be reproduced accuratley ensuring our CoSHH cabinets are of superior quality. The blanks are then formed into something that resembles a CoSHH cabinet. Using a machine called a “Press brake” a 60 tonne force is applied to the steel through a top and bottom “V” shaped tool. This forms a tight bend in the steel to a predetermined angle. The bent bodies and doors of the CoSHH cabinets are then passed on to other operators to be welded together. 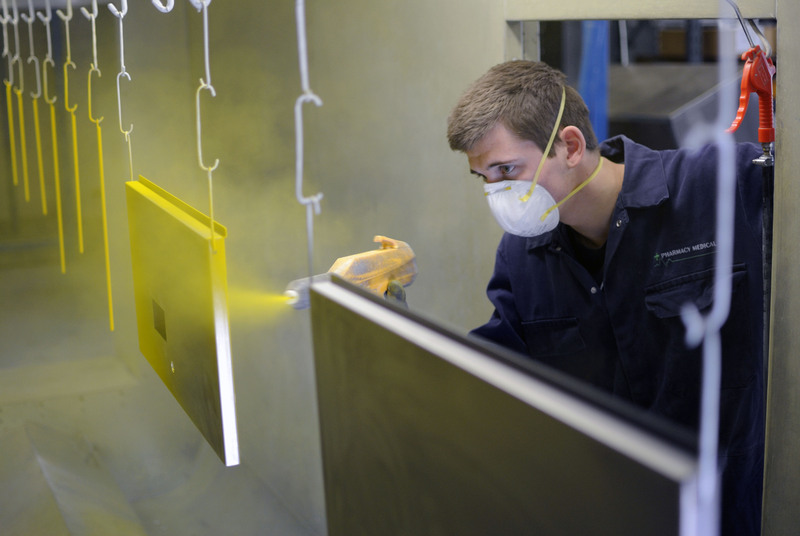 The finished CoSHH cabinet assemblies are taken over to a purpose built powder coating plant adjacent to the fabrication facility. Here they are de-greased and thoroughly cleaned to remove all traces of grease and dirt. The parts are then suspended from an overhead conveyor which will transport them around the whole powder coating process. The painting process consists of a powder which is applied using an electrostatic gun. 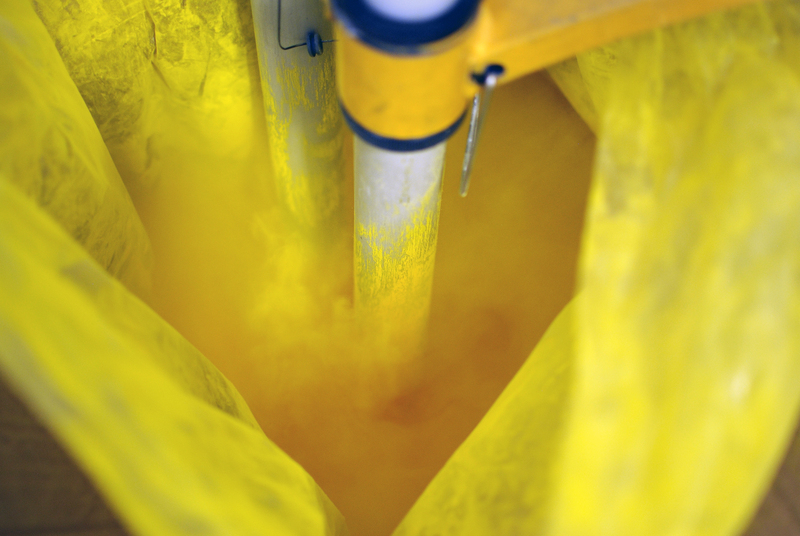 The gun applies up to 100,000 volts of positive static charge to the fine powder particles which is fired at and attracted to the negatively charged work pieces. These parts are electrically earthed so the charged particles will stick until melted and fused into a solid coat in the curing oven. Once the paint is applied, they are then transferred to a curing oven. This oven is a long tunnel through which the cabinet body assemblies are passed after the powder has been applied. This oven is at a constant 215 degrees centigrade and the cabinet parts need to be at that temperature for 12 – 15 minutes to allow the powder to form into a solid coating. Upon exiting the oven on the conveyor the parts cool and are removed to be taken to the assembly bench. Operators then assemble the body and sides of the CoSHH cabinet that have been formed in the previous step, then put small tack welds at various intervals along the joints to position the component parts prior to welding. This holds the cabinet in the correct shape. Now the CoSHH cabinet is starting to look like a Cabinet. The cabinets are then welded together. Due to the requirements of the CoSHH regulations, when making CoSHH cabinets the operators do not need to fully weld a cabinet. The base section of the cabinet is fully welded. This forms the sump of the cabinet and needs to be water tight to hold any spilled liquids. The remainder of the cabinet is ‘spot welded’. This securely fixes the components of the cabinet together. Using a spot, or puddle weld is a slightly more secure method than a pop rivet as there is a physical connection between the panels and reduces cabinet distortion. 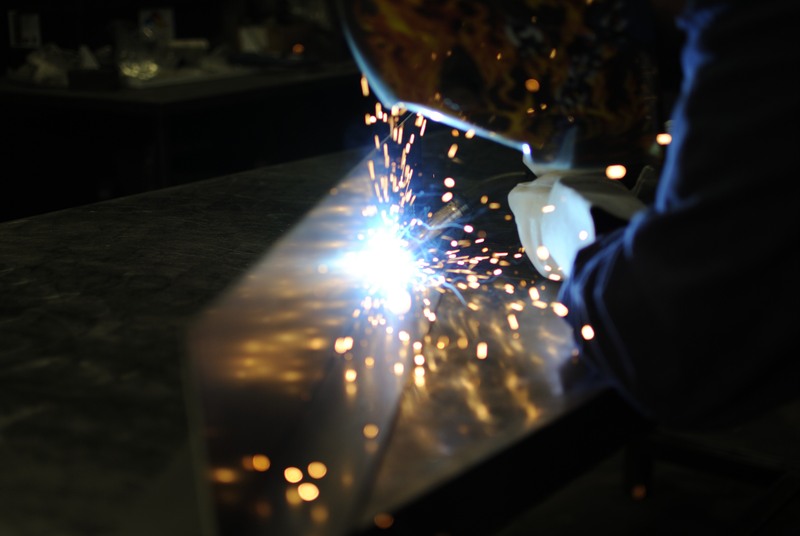 When making CoSHH cabinets, the operators use a method of welding called TIG (Tungsten inert gas ) which gives a very precise and neat weld therefore reducing the need for excessive dressing of the weld. Here the CoSHH cabinets are completed. At this stage the locking mechanisms are installed, the handle installed, and the doors connected to the body. The assembly process is almost identical for all cabinet variations. Once the cabinet has been assembled, they are then packaged and sent to storage awaiting your order.